My experience with optimizes360 has been nothing but excellent. I was working directly with Charles B and he was extremely helpful through the entire process. He was very responsive and timely with implementing all the necessary updates that was recommended by my team and I. I could not have asked for a better point of contact than Charles. I will definitely recommend not only the company Optimzized360 but would recommend asking to be linked with Charles B. as your point of contact. He will make this stressful process very smooth for you and your team. We are so impressed with Optimized360! From initial contact through the entirety of the project, the team was communicative, detailed, and professional. We first spoke with Danny N., he was transparent and listened to our requests by then providing us with a personalized project proposal based on our needs. Throughout the project, we worked with our designer, Suzanne L. who consistently showed outstanding customer service. She was responsive, efficient, and delivered a website that directly reflected our requests. By far the most professional, efficient, and honest website dev company I have ever worked with – I could not recommend the team at Optimized360 more!! I have been impressed with the prompt, clear communication with Charles, and his ability to grasp a vision for the website! Thank you, Charles, for your attention to detail and responsiveness. I had excellent results using Optimized360 for my new medical practice website design. All options that were discussed were delivered as promised. I’m happy with the unique design of the website (from scratch) and was not made from a template and that it is exclusive to our practice. It was evident throughout the process that Optimized360 specializes in medical/dental practice design which was very important for my needs. The entire process from initial discussions with Danny to the finalizing of my new website was a smooth transaction. My designer, Suzanne was very attentive to my design needs and responded promptly to my requests. I highly recommend the team at Optimized360. Perfect! So glad we chose Optimized 360! Charles B. and Danny N. at Optimized 360 are awesome, they really took care of the process of creating and designing a new website that not only looks great, but transitions great, loads super fast and is secure! They have great customer service skills, respond quickly and are great at what they do! Optimized360 is top notch when it comes to medical web design. Danny, our account manager has been very helpful and informative, giving us all the information we needed to make an informed decision. Charles, our extremely talented designer has done nothing but exceptional work. He had our website up and running in just a few short months. Although we threw him a few curve balls and did demand quite a bit of attention, he was patient and treated us as if we were his only client. His patience and understanding was greatly appreciated. 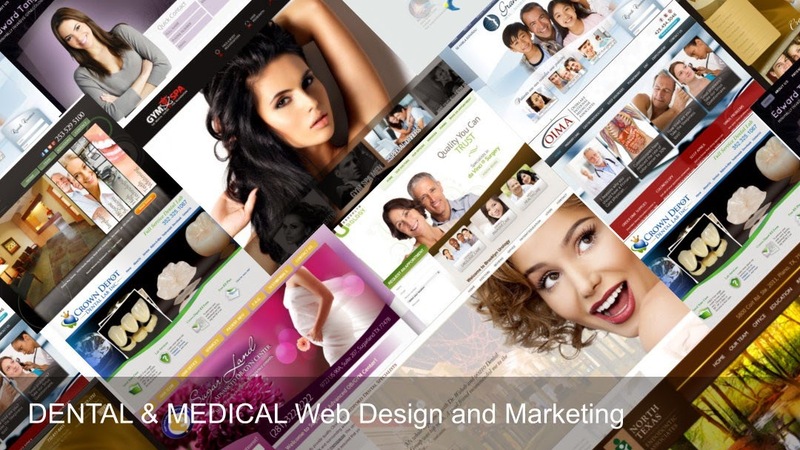 We highly recommend O360 for medical web design. Optimize360 brought the vision for our new site to life. I worked with Charles B. throughout the entire process and despite all of our change requests and delays in decision making – he stayed patient, kind and helpful the entire time. He was a pleasure to work with and helped us achieve a beautiful, functional site. We’re very pleased with our new site and its something we proud to have as a first representation of our practice. I chose Optimized 360 for building a custom website for my new dental practice. Their team including Charles B listened carefully to what I had in mind, and brought my vision to life over the course of a couple of weeks. I had a very specific idea of what I wanted and the team had no problem working with me to build a truly CUSTOM design. There are no templates which is great. Charles B was very attentive to my changes going through multiple rounds of drafts to the website and the answer was always yes. I thank him for going through many phone conversations and giving me as much time as I needed to relay my thoughts. One of the best parts is that this developer provides clients with a powerful website editor suite that allows me to make minor or major changes to the website in seconds, which is something that was very important to me – not a given with other companies. Optimized 360 and Charles were wonderful to work with. They guided us through the web creating process and came up with a wonderful site. You won’t be disappointed if you choose this company. We used (and continue to use) Optimized360 to build and maintain the website for our dental practice. We have been very pleased with their service. Charles B created a beautiful and functional (easily navigated) website for us out of very little information from us. He then modified it to represent us perfectly! He responded promptly and really captured our vision and made it a reality. We are very pleased! Working in the healthcare field, I understand the importance of a professional, up to date website (which can translate in a patient’s mind to a professional, up to date office), as well as the value in SEO optimization. We worked with Charles B, and we are thrilled with the result. Our website is extremely functional, looks high-end, and we have had great communication with Charles B. regarding any changes or updates. We highly recommend both Charles B. and Optimized360 to any healthcare professional looking for exceptional quality and service in developing their website. A Big Thanks to the team at Optimized360 for developing our website. Chandra is always quick to respond to questions and edit requests, and the creative team does awesome work. I will start by saying that selecting a web developer for any business can be overwhelming and stressful. After reviewing and evaluating multiple companies we selected Optimized360. The business relationship started off great although there were ups and downs with the process. The primary downs were timing and communication issues. There were times where the frustration really mounted with our 1st contact/consultant which had us experiencing buyers remorse but the situation was ultimately resolved when Charles B. came into the picture as our new account manager. Charles B. Diligently worked to resolve all issues with our web design and made certain that our finished product was in line with our vision. He took the time to listen, understand and deliver a quality product. Working with Charles B. you never get a no, instead you get action and the genuine attempt to resolve your concern or issue. If he can’t immediately resolve he ensures the Optimized360 team gets it done. In our practice, like any business, time is valuable and can not be wasted on repeat concerns/problems. In all, Optimized360 will deliver a quality product for a very reasonable price point. Expect some ups and downs and if your starting out ask for Charles B. to be your account manager which I guarantee will save you a few headaches down the road. It has been a great experience over the past year working with Optimized 360. We love our website and new patients to our office almost always reference the website as to how they discovered our practice. Charles B has been amazing and extremely helpful. He is always friendly and quickly responds to our requests every time. It is pleasure working with him. Thank you Charles B.
Charles was very responsive and helpful with recent issues I faced when editing and updating our Endodontic Group’s website! Highly recommend Optimized360 to anyone who is looking to better their web presence! We recently became new clients of Optimized 360 and are in the process of creating a permanent website. For the most part our experience has been good with a few “bumps” along the way. However, we recently started working with Derrick as our contact and consultant for the website and have had a much more immediate response time and resolution on our requests and input. He is so professional in his correspondence and we really feel he is giving careful consideration to everything we ask of him!! Everyone at Optimized360 has been a pleasure to work with. Our new site is beautiful and is everything we hoped for! It has been a rewarding investment to have had Optimized360 design and publish our company website. I regularly interfaced with the company representatives – Charles B (Sr. Web Designer) and Vivian G. (Sr. Marketer), who in our experience are the benchmark for professionals in their respective fields. Their attention to detail and the fact they never failed to deliver on any promise. Sincerely, If you’re considering website build and management, be braced for the Optimized360 best experience. Just imagine, we count our relationship with Optimized360 a great addition to our company. I look forward to working with them for years to come. I am very impressed with Optimized 360! Both Ralph R. and Charles B. have been extremely responsive and so helpful with answering any questions I have had and explaining the whole process of website redesign thoroughly to me. Absolutely would recommend Optimized 360 to anyone wanting to modernize or revamp their website. After having a website with a cookie cutter web design company, I decided to take the leap into a custom site with Optimized 360. I will tell you I couldn’t be happier with that choice. From initial design to going live they were total professionals and highly competent in all phases. Danny and his team answered all of my questions during the entire process and were easily accessible by e-mail or a quick call when I had an idea or change to the design. I would not hesitate to recommend them to any of my colleagues for web design and support services. But I can tell you that I will not be letting my competition know about them LOL. Optimized 360 is next level!! I hired them for my new website and they delivered. They delivered what they promised and blew away my expectations. To make it even better, I’m working with Brent to manage my SEO and do some marketing on a Google and the results are extremely good. Getting new patients the first week of our campaign. My dental office is dominating San Jose and I have Brent to thank. Definitely the best company and crew I’ve worked with in my 25 years of owning a dental office. Keep up the great work!! They designed my website and did an amazing job on it. Great customer service as well and responds within 24 hours. Thank you! The entire team at Optimized360 blew me away. The professionalism and attention to detail to deliver exactly what i wanted. Desirae was phenomenal to work with and was in constant communication to provide updates. Site was completed on time and brought my vision to life. Great Job!! We have been very pleased with the constant support provided by Optimized 360 in helping us build our amazing new website. Our Art Director, Jessica C., was so prompt in replying to all our meticulous requests and always made sure our changes were addressed in a timely manner. I would definitely recommend them to anyone wanting to a deliver a top-notch, clean, modern looking website who truly cares about your satisfaction in the end. Excellent communication and follow up by the entire team! Catherine stays on top of any edits! We were ready to change up our website management, and decided to give Optimized 360 a shot. Danny and Jan were amazing and a pleasure to work with!! We were able to migrate our site over within a weeks’ notice.They were very responsive and on the ball to say the least!! We were obviously concerned about interruptions, which caused some slight hesitation…Happy to report that we had zero downtime on the site and no issues to date. By far the most efficient website company I have encountered in my career. I would highly recommend them to anyone who is looking for a change…totally worth it! Our practice has been working with this company for a few years now, and we have had a great experience. They have really helped to set our website apart with a custom design and have been very responsive with their customer support. We have now expanded to utilizing them for our SEO and blog. I have enjoyed working with the whole team. I highly recommend Optimized 360. Jessica C worked with me during the customization process. She was very helpful with every aspect of the design which concluded with a fantastic website and a brand new up to date logo. Thank you OPTIMIZED 360 and JESSICA C.
I highly recommend Optimized 360. My experience has been outstanding. My new website has been a huge success with patients and colleagues. This company has my highest recommendation. I work with web and marketing companies every single day and my experience with Optimized 360 was second to none! I was personally working with Danny and he treated me like I was his only priority! He responded quickly, kept me in the loop, and above all, was a complete professional…. needless to say the finished product was executed perfectly! Optimized 360 is an awesome company and their customer service and product are the epitome of this! I can’t wait to work with them again! I’ll be the first to admit: I don’t know the first thing about websites. I type in words into a box and they appear. All I knew was that I needed one for my business, and was referred to Optimized 360 by a close professional friend. For someone who gets intimidated at the thought of signing up for an e-mail, this was perfect! Everyone was very helpful and knowledgeable. The staff took me through the steps to help me get exactly what I wanted, and taught me all the steps I needed to know to maintain it myself. I can’t say enough how happy I am with their service. Thank you! I am really impressed by Optimized360’s quality work and marketing expertise they have done for us. Another great “outside the box” adaptation of our website to incorporate our new Google See Inside video. Thanks for your open-minded creativity! My website looks great. Thank you Optimized 360! I had an old website I hated, they did such a good job creating something that I like and is true to the spirit of our practice. One of the best companies I have every worked with. Caring people who listen. Thumbs up to the team at Optimized360. Love our new website. Started off a little rocky, but very quick to get us all on the same page. Very quick to make any adjustment and changes as needed as well. Optimized has been very responsive. We are happy with all of the changes you have helped us make. This place was a okay. Their tech support is awesome and prompt. I have been with Optimized360 for several years for my dental practice website, and they have always been great and supportive of my needs. Thank you. Optimized 360 has done a beautiful job creating my website. I am grateful for their amazing creative work, and rapid response to all my questions, requests, and ongoing changes to my new website. They are an absolute pleasure to work with, and I highly recommend Optimized 360. I use Optimized 360 for my medical websites. They have done a phenomenal job, my patients love the websites (as do I). Sandie has created a beautiful website for me. Belinda the creative director is simply a genius and super hard working! I appreciate all their work especially because I’m pretty specific and demanding with what I want, and Optimized 360 has delivered pretty much everything I could ask for. Highly recommended!!! Very pleased! Justin Nigro was the first person I spoke to. He followed up very professionally after our first talk.. Then he helped me by introducing to Mitchell who was the designer for my website. Mitchell was very good from the start and very willing to work with me , my needs and ideas during my website design. I highly recommend Optimized 360. They are awesome! We have been with Optimized for 1.5 years now and we are continually impressed by their quick turn around times on edits to our website. The are infinitely patient with questions small and large and had a variety of insightful suggestions for the evolution of the website in light of growth we are experiencing as a company that would further highlight our strengths. It is also refreshing to encounter an organization that understands the challenges and opportunities of operating a small business. We grateful we have them as a partner. I truly enjoyed working with Optimized360, great service, very professional staff. I worked with Mitchell, and he is amazing, knows exactly what I want. Thank you Mitchell for all your hard work and dedication, I would definitely recommend you to all my other colleagues. Optimized 360 is a great company to work with and Michael did a great job helping us get exactly what we needed. We are very satisfied with our web design. Our experience with optimized 360 has been nothing but positive. Danny and the team are very efficient and pleasant to deal with. Would highly recommend their services. I have worked with this company for many years, I have changed my website a couple of times over the years and people like Olivia, Danny and their support staff have been exceptional and attentive to my needs. Being a novice to social media and the ever changing google, I have learned a significant amount of knowledge which has helped me be active with my website, links to blog, facebook etc. which in a matter of a couple of weeks have helped me move from up in google rankings and resulted in more new patients. I have recommended them highly to several of my colleagues and will continuously do so. Bella Vida Healthcare Clinic along with myself have been working with Optimized for a few years now and have had nothing but excellent service! As Bella Vida’s marketing manager, Optimized is always available to answer my questions, hear my concerns, and above all does an excellent job managing our site! I Highly recommend them for your business! Optimized360 is a leading internet marketing firm for dentists, physicians and other healthcare professionals in the U.S. and Canada. We’ve developed a unique formula that produces effective and efficient web presence solutions for doctors of all specialties. Web Design from scratch. Specialized for dentists and healthcare professionals. Internet Marketing. SEO and PPC.